Spacious 5 bedroom, 5 bathroom country house with an independent apartment for sale in Velez Rubio, Almer?a. This beautiful Andalusian cortijo is located on a 20,152 m2 plot of natural land. The main residence is divided into two floors: on the ground floor there is a large living room with fireplace and large dining area, it has beautiful beamed ceilings, an equipped kitchen and 3 bedrooms, two of them are especially large and all with private bathrooms. From the lobby, a staircase leads to the first floor. The staircase ends in a large living room on both sides of the landing leading to 2 spacious bedrooms, each with a bathroom. From these two rooms there are breathtaking views of the surrounding mountains. Attached to the main house, but independent, is an apartment consisting of an open-plan living-dining room, a bedroom and a shower room. Next to the apartment, but on a lower level, there is a huge warehouse that stores the large generator that supplies power to the house, machinery for the pool, and machinery that provides central heating and hot water to the house, including the boiler and the oil tank. There is still plenty of room for storage. The Cortijo has a total constructed area of 292 m2. The ground floor has 184 m2 built, including the apartment that has 40 m2, and the first floor has 108 m2 built. Outside, next to the house there is an 8m x 4m swimming pool and a small children`s pool, surrounded by tiles. The terraced area has been fenced all over, but still maintains the panoramic view of the surrounding mountains. Outside, at the rear of the property is a beautiful terraced area with a BBQ and a pergola. From here there are stunning views of the pretty typical Andalusian town of Velez-Blanco with its famous castle on top. The property has a central heating system and hot water installed throughout the property. The electricity is through a powerful generator. The water is through deposit. There are also stables for horses. The property is located on a large plot of 20,152 square meters and is located on the border of Murcia-Andalusia. The property enjoys total privacy and magnificent views of the surrounding mountains and countryside. The property is located about 15 minutes from the town of Velez Rubio, where you will find numerous bars, restaurants, supermarkets, etc. It is about 90 minutes from three Spanish airports - Alicante, Almeria and Murcia. 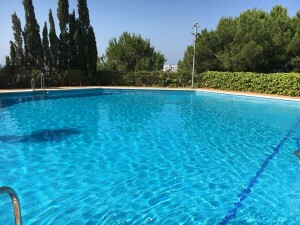 The property is 50 minutes from the beaches of Aquillas and Mojacar. The golf courses of Lorca Golf Resort and Mundo Aguilon Golf Resort are just 40 minutes from the property. It is a great opportunity for nature lovers, to live with family or to do a B & B and earn an extra income. It is a property that deserves to be visited ! For more information do not hesitate to contact AlmeriaCasas !